A double wide mobile home is manufactured in a factory and then moved to a piece of land once complete. This obviously differs from a site built home, which is constructed right on a piece of land and has a foundation that extends into the ground. Standard sized mobile homes are often referred to as trailers and offer only limited space. As a result, many homeowners or renters will choose to occupy a double wide unit. Double wide units are, as you can guess, are twice as wide as a regular single wide mobile home. Creating a double wide is accomplished by taking two sections that are standard size and physically bolting them together to create one home. This of course creates more space for the resident, and allows the mobile home to look more like a site built home than a single trailer. Most double wides are rectangular in shape once constructed. In some cases, a third section or even a fourth section may be added to create a much larger home. 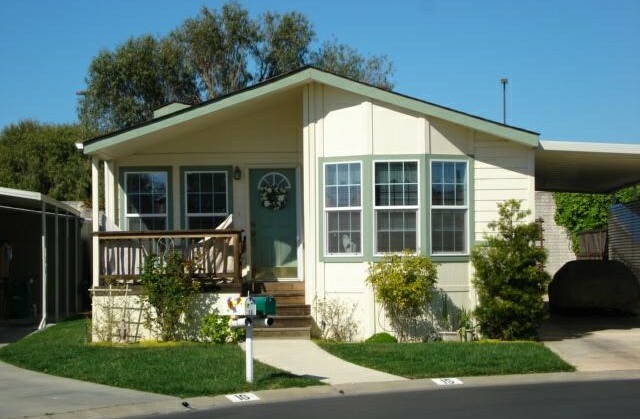 Since there are many manufacturers of mobile homes, the exact dimensions are dependent upon who creates it. When it comes to width, a double wide home is likely to be either 8, 10, 12, 14, or 16 feet wide. The units are typically either 42, 48, 50, 56, or 60 feet long. These dimensions include all of the interior floor plan, but don’t take into consideration any outdoor spaces such as a front porch or covered parking. 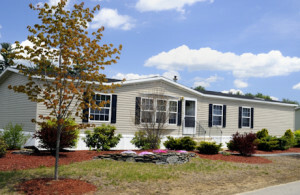 Double wide mobile homes may be comprised of two identical units that are largely mirror images when connected. However, for the sake of practicality they are usually designed to have only one of certain features such as a kitchen or a breakfast nook. One part may also be longer than the other, or they may be of equal length. Double wides include all the amenities that one would expect in a site built home, such as multiple bedrooms and bathrooms. Some units might even offer a skylight or hardwood flooring. While a mobile home has an axle and wheels that allow it to be moved when necessary, these features are often hidden by exterior siding, so the home looks like it is sitting on a regular foundation. Because these features sit underneath the home, they do not infringe upon the resident’s living space. Some new double wide mobile homes have what is called a push out, or a slide out. This is a space that can be made flush with the surrounding walls of the home, for instance during transport, or popped out to create some additional floor space. A push out requires ample space around the perimeter of the home, as the room is a sort of home addition that will take up space on one side of the unit. A push out has walls and a roof, so it serves as an actual room as opposed to a porch or other outdoor space with awning.